Arbutus RV Voted #1 RV Dealer on VANCOUVER ISLAND! 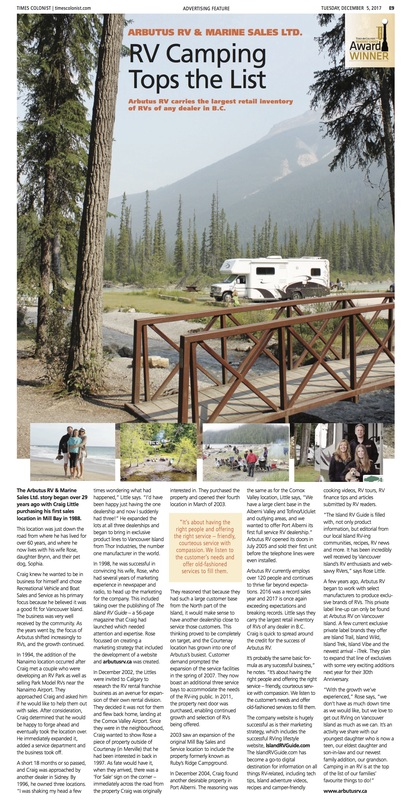 You are at:Home»Specials & News»Interesting News & Info»Arbutus RV Voted #1 RV Dealer on VANCOUVER ISLAND! We’re not going to be bashful about sharing this great news – we’re very proud! Our Arbutus RV Team has earned the title “BEST Vancouver Island RV Dealer – 2017”! 47,000 ballots were cast in this year’s Times Colonist Reader’s Choice Awards contest and Arbutus RV is YOUR choice for #1. We are honoured. Next Article Career Opportunities at Vancouver Island’s #1 RV Dealer!